Interesting. I’ve been following threads of information about the wearing of headcoverings (or not) for women in church for some time now. For my generation, headcoverings were never the norm, except possibly for old women who dressed oddly (to a young person’s eyes) anyway. But more and more I’m seeing literature that basically says it is immoral for women to go uncovered in church. I’m not one to appreciate being accused of immoral behavior, and I feel compelled to investigate further. That article does nothing to clear the waters. Are headcoverings simply a matter of fashion/custom? Or was this “change” just another bad reform of the 60s? Personally, I’m wondering how old I have to be before I can wear a babushka. Bill seems to think I have to wait until he’s dead. 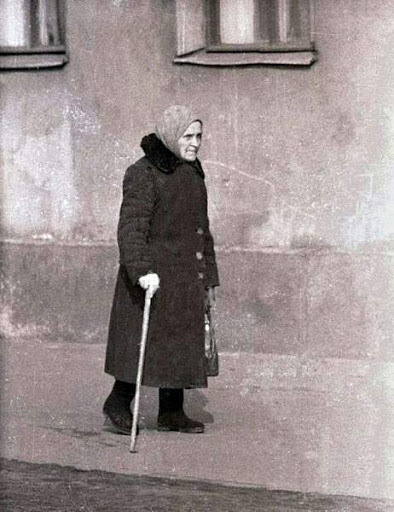 Updated to add this photo of a babushka. That’s the look I’m going for when I’m older. Classic style is never out of fashion. Updated again to explain where I’m going with this. There was a time when Catholics, generally, would never use birth control. Although Church teaching has never wavered regarding its immorality, many Catholics today don’t think twice about using it. If I were to attend a church where the custom was to wear a headcovering, I would have no problem wearing one. I’m just having difficulty figuring out if this is truly a local custom (when in Rome) thing, or if, like birth control, its use (or not) has been dictated by secular forces rather than theological ones. Updated, once again to include the link to canon lawyer Edward J. Peters’ posting about this issue. Thank you, Denise, for bringing that to my attention. I think I’ve come full circle on this. When attending certain churches, particularly outdoor Masses in vacation areas, the clothing is often very casual, even khaki shorts are “dressy,” and I tend to dress similarly. When attending other churches and most people wear their Sunday best every Sunday, I make an attempt to follow suit. In other words, I don’t have certain clothes that I wear on Sunday no matter what anyone else is doing, although I really would have difficulty wearing shorts to church unless it were a Mass at a camp or other truly rustic locale. My current parish has very few women wearing headcoverings of any kind. Those who do are generally wearing flamboyant red hats. If every woman in the church wore a flamboyant red hat, I might be persuaded to wear a hat. But it wouldn’t be red. And it wouldn’t be flamboyant. If every woman in the church were wearing a black mantilla, I might wear a black mantilla. Or I might wear the very pretty blue Afghani headscarf Bill bought me instead. But I would cover my head. I wholeheartedly agree with the premise of modesty and submission which seems to be tied to the custom. But if it is not an obligation to wear one, then I don’t feel the need to stand apart from other women in a church and make that public statement. ← ER visit – what better way to spend the evening? I don’t see how headcoverings or a lack of them can be considered immoral. Or immodest. Or im-anything else. I am old enough (ugh!) that I wore them as a child. Just the hanky type — until about grade five (after VC II). And I have also read many debates. I personally think that if I wore a head covering it would distract me from prayerful worship. Mostly because I would be the only one wearing one (and I happen to attend a very reverent church). I guess in this day, one would really have to examine the reason behind choosing to cover their head. We had a family in our (military!) church who covered their heads always, not just in church.I’ve been wondering if covering my head during church is something I’d like to start doing. I know that I pay way too much attention to my hair before going to church, and when I catch the reflection of myself in the crying room window, I will often untuck it/retuck it behind my ear to make it look better. I think covering my hair would help me put my focus back where it belongs. < HREF="http://www.canonlaw.info/2006/09/vatican-ii-canon-1262-and-chapel-veils.html" REL="nofollow">Here is a good discussion from a canon lawyer whom I respect<>. I wrote about my own conflicted feelings < HREF="http://catholic-mom.blogspot.com/2007/03/personal-piety.html" REL="nofollow">here<>. I really am drawn to wearing the veil as a sign of my distinct role as a woman in the Church as well as an act of humility before God. However, in my regular parish I think it would be distracting. I have been attending daily Mass at a parish close to my home where there are quite a few women who wear a veil. I have taken to wearing one then and really do find it a spiritually positive experience. I miss it when I attend my regular parish, but am not so attached to the devotion that I will wear a veil at all costs. Right now this is the compromise between my personal preference and the good of the community worship. I cover at church, and find that most of the time, it centers me and helps me to be prayerful.Sometimes, though, it is distracting.I am blessed to have a lovely mantilla from my Grandmother (may her Memory be Eternal) that I do wear often. I often wear a mantilla at Mass and during Adoration, but I did not grow up with this. Vatican II never did away with the headcovering…the out of control media did, just feeding into the feminist bra-burning hysterics of the times. It is considered now to be a personal devotion in areas where it is not custom or required, and I wear it for many reasons: to remind me that I’m in a holy place, to remind me of my dignity as a woman, to remind me to look to Mary as the ultimate feminine role model, and to cover my vanity…my hair. It does have to do with modesty to a certain degree. As far as the person who commented about the sexes being equal before God…headcoverings have nothing to do with that. Men and women have different, complimentary roles to each other, and the secular concepts of “feminism” which are largely false, do nothing but undermine the true dignity of women everywhere; such a concept has no place in the Church. Truly men and women are equal before God, but we need to remember that equality before God doesn’t mean “androgynous” as some would have us define it. I used to be a feminist myself, and still consider myself so, but I’ve left the radicalism behind me and have found that embracing some of these traditional practices has been very healing. Veils are still very much in Canon Law, however, in most places it has simply become custom to wear or not to wear. In truth, we are all called to wear them, although I’m not necessarily advocating for that. I usually wear a black one that blends in with my clothing and hair, thus standing out less. It helps. Adore te devote: Please take a look at the link to canon lawyer Ed Peters in my comment above. Specifically:<><>I yield to no man in my admiration of the 1917 Code, but its Canon 1262 went out of force in November, 1983 (see 1983 CIC 6); the 1983 Code simply does not require women to cover their heads in church. (By the way, if 1917 CIC 1262 were still in force, we’d have to explain why we don’t observe its other norms, like separate seating for men and women in church. )<><>Wearing a head covering is a perfectly acceptable form of private devotion, but it is not a Canon Law requirement. I too remember wearing these as a child. Yet I dont know when or why we stopped. But I see where you are going with this. Is this like birth control, or when we were kids we ate no meat on fridays all through the year. Then it stopped. I now know that it is a disipline of the church not a law. Fr. Corapi said disiplines can be change but church law or church teachings cant. Please correct me if I am mistaken. um, I don’t know either. In Texas I saw the lacy head cover a lot more than I expected, but haven’t seen it since coming back to California (of course). I’ll be anxious to read what you discover in your research. I don’t wear a headcovering – nor does anyone at my parish. However, I have attended Latin masses wear women do wear them – and I am intrigued. I wear a mantilla whenever I am in the presence of the Blessed Sacrament, whether I am in Mass or not. My reasons coincide with Adoro Te Devote’s, but I know that the 1917 Code of Canon Law is no longer in force. Until tonight, I thought that anything not specifically eradicated by the 1983 Code was still in force, but I just found out that that WOULD be the case, except that the 1983 Code specifically abrogated the 1917 code in its entirety. So, we don’t HAVE to cover our heads, but I think it is a beautiful custom. I wear one wherever Jesus is present.Incidentally, Vatican II did not change the Code of Canon Law, so we WERE supposed to be wearing head coverings in church UNTIL 1983 (and female altar servers were not supposed to exist until then either). How many of us knew that at the time? I LOVE MY VEIL. This is a huge topic for me right now. The Sunday before Lent as I received Holy Communion, I felt very grateful to God and I wanted to show him my utmost respect and adoration. In that moment I suddenly had a picture in my mind of two women wearing veils and looking very humble and worshipful: a wonderful lady in my church, and my Jewish mother when she lit the candles for the Passover seder. I knew in that moment that I could show my deepest humility and love for God by wearing a veil.BUT I DIDN’T WANT TO. Mainly just because I’m shy and hate drawing attention to myself. I live in a small town and didn’t want people to think I was weird. And I really didn’t want them to think I was trying to be “holier than thou.” But God kept nudging me. I couldn’t get the veil thing off my mind. A few weeks later I bought one on ebay.I WAS REALLY SCARED to put it on the first time. So I wore it to the Stations of the Cross to sort of “try it out.” I was so nervous, but I just took a deep breath, put it on, and went into the church. (With my four little kids in tow. )THAT was about two weeks before Easter, and I haven’t gone to church without it since. I can’t explain it, but I just feel like I am able to be truly worshipful and in the presence of God with it on. I also feel like I am physically celebrating 2,000 years of tradition when I have it on. As a convert, I love the ancient traditions of the Catholic church. No other church has that! It’s part of what makes the Catholic Church so deep and rich and gorgeous. I followed this thread from somewhere else (now I can’t remember where; those blog links can take us on fun journeys). My family is kind of “bi-ritual” if you will. Sometimes I go to the regular parish church, and much of the time my family goes to the diocesan Tridentine Latin Mass, where my husband sings in the choir. I see covering one’s head as a discipline and a custom. The discipline was changed so it is now optional. It is still a custom in the traditional Latin Mass (though by no means a requirement). It is not a custom in the newer Mass (though it’s certainly okay). I do go by “when in Rome do as the Romans do” on this one. I have followed the head covering/ no head covering conversation. I remember pinning on a tattered Kleenex for a covering. Reverent? Yeah, right. In some cultures, a head covering,yes! And when I was a child, men and women sat on opposite sides of the church. My grandparents never worshipped together most of their 50 plus years. And she wore a babushka. And all the people prayed the rosary during the Latin Mass. And God in His infinite wisdom knows our innermost thoughts and loves us in our imperfections. Thank God. During most of the year we attend a Latin Mass and I have found a pretty blue silk triangle scarf that ties under my chin to wear to Mass. However, we summer up in Maine and attend a Novus Ordo, very liberal parish where I don’t wear a veil. I tried it a few times and felt like I was proclaiming to the rafters, “holier than thou,” especially with 5 little kids in tow and no one else in the parish having more than 2 hippy-speak “enviromental disasters”.